We have followed the career of Heather O'Donnell, a prize-winning American-born pianist based in Berlin, since enjoying her playing of Charles Ives and Jonathan Harvey in competition (Gaudeamus 2001). Her own Ives CD is due for release later this year. Reviewing recently a new CD including Jonathan Harvey’s Tombeau de Messiaen, with electronics and live piano perfectly balanced, brought back memories of that competition in Rotterdam (2001) and indeed, our experiences of the fickleness of performance competitions. I have only recently learnt from Heather that for all of twenty years her international career has been a long fight against disability and pain. As a teenager her first arm problems were mis-diagnosed as tendonitis. Later Carpal Tunnel Syndrome, treated with some temporary benefit. 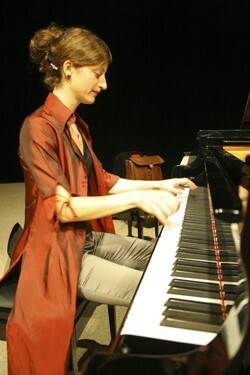 In 2006 disastrous mismanagement of supposed "muscular tensions", left her unable to as much as play a simple scale for a while... A broadcast concert in Cologne that December was an agonising trial "I had to practice and practice like a madman to get anywhere, which in turn of course aggravated the problems". Every concert was a gamble; usually a lot of pain in preparing, but then for the concert I'd have "a little boost of adrenalin which helped me get through. I had to cancel a couple of concerts in 2006-2007, but remarkably few considering the circumstances." Recently Heather O'Donnell has published her experiences on her blog ESSAYS BEFORE A PIANO. I've been procrastinating writing this blog for some time now. I knew I wanted my next blog to be on this certain topic, but it's a big one, and a hard one. And pianists don't wear their injuries on their sleeves with any small degree of grace, or as a badge of honor. Otherwise we might know more about the physiological reasons behind Horowitz and Gould's extended breaks from concertizing, and Fleischer may have not responded to the early onset of focal dystonia by "practicing harder and longer". My hand problems have been gloriously multifarious, spanning 20 years, and encompassing a plethora of colorful diagnoses; carpal tunnel, tendonitis, overuse syndrome, neck injuries resulting from a falling-out-of-bed incident as a 5 year-old, weak eyesight resulting in ocular muscle-strain, muscular dystrophy, and most titillating of all, focal dystonia, the big Hog Daddy of musicians' injuries, one that mostly leads to complete abandonment of all musical pursuits. Doctors I worked with often expressed frustration with their inability to pinpoint and treat the problem, as I'd often come back week to week with rotating pains between various parts of my right and left arms and hands. When my right hand improved, my left hand started acting up, as if demanding equal rights for pain and discomfort. More than one doctor gently suggested seeking the aid of a psychoanalyst specialized in extreme cases of psychosomatic delusion. At the worst point, the structure (bridge) of my hands had collapsed, the whole right side of my body sagged lower than the left, and my fourth finger in my left hand shook uncontrollably whenever I put any weight on it. An unhappy conundrum. The problems lingered, sometimes flaring up to levels which paralyzed my playing for some time, but mostly staying at a bearable though immensely frustrating level. Pain has been an almost daily companion in practice and performance for much of the past 20 years. Rather simple elements in piano technique have been extremely difficult to grasp. I had the feeling of having to practice much more than my colleagues in order to maintain a professional level, this over-practicing in turn was a classic Catch-22 which only aggravated problems. There was an uncomfortable feeling of not being in control of my hands, not sensing their intricacy, and "making-do" with pianistic tools that seemed (and were) increasingly inadequate for the tasks they were asked to do. The explanation for these problems came almost one year ago after a hospitalization for extremely low blood levels (something which also was connected to the health problems). The cause of this suffering is a strange but not uncommon one, though it was a condition totally unknown to me before the diagnosis. I was diagnosed with Celiac disease, an extreme gluten-intolerance that forces the body to react to the confrontation of gluten as a low-level poison, constantly building dangerous levels of antibodies that then turn on the body and attack it in various ways (internal organs, nerve-endings, muscles). The cure is simple, no more bread. Or cookies. Or cake, pasta, soy sauce, beer, chips, crackers, pizza, and most kinds of junk foods. Finding out the cause of these problems is at once an enormous relief but also produces a sinking feeling of having lost a lot of time dealing with the physical, psychological, and emotional effects of not knowing why things were not functioning well. The pianistic cure is not simple. Deeply ingrained habits that were developed with a faulty physical system in order to find solutions to pianistic challenges must be methodically and pain-stakingly retrained. One example- I always relied on a quick thrust from the lower arms to produce loud chords, which was the only solution I could find at the time though it produced a brittle and ugly sound. Having used this 'solution' countless times over the past decade or so, it takes a lot of time and patience to introduce new ways of confronting a chord. I had to practice in a way that any Zen master would be proud of. Months and months of work went into single soft tones, using each tone as an opportunity to trace the connection between the finger and the back, with all of the various points in between. When I felt confident that I could play the single tones without immediately resorting to old habits, I could move onto 2-note chords, 3-note chords, etc. I had the great fortune to work with a pianist in Berlin with a deep knowledge of anatomy, neurology, and various pianistic ailments ( I'd be happy to share details with anyone... write me!) who encouraged me to find these kinds of connections. There was a feeling of having great gaping holes in my sensory perception that I had to fill through the strength of imagination (and images provided by this teacher) until the brain finally could confront, understand, and recognize these sensory "black holes". Practicing had to become non-musical for a long period of time, preoccupation with the physical components of piano playing very much took the foreground . Playing though pieces for enjoyment wasn't an option, as the hands would respond to this wild abandonment through several days of 'sulking' with the all-too familiar aches and pains. This kind of hyper-aware practicing is not always enjoyable, especially because it's often accompanied with uncomfortable sensations of pain, but it did introduce an element for me in being deeply tuned into the messages sent from within. I have gained through this experience a new humility in dealing with my body. I listen to it. I respect its signals. I don't trespass. I suppose this kind of self-awareness is something common to people who practice meditation. I'm emerging from this experience with a great sense of awe in the subtlety, fineness, and beauty of our capabilities as healthy human beings.